Particularly bizarre is that the footnoted citation doesn't even support the claim -- it says nothing about "the approaching 1981 Christmas season." I don't think its bizarre, you're assuming the reference was there for the date. It looks like its referencing the fact of it being rushed, which is mentioned in that article. Edited by wgungfu, Tue Oct 14, 2008 11:02 AM. I should also mention, I was around during the whole DP banning process as well. An individual was spamming dp links (which is looked down on there) throughout video game articles over several different accounts over a several year period. That individual was also consistently vandalizing specific articles from those accounts. As such, the admins finally had enough and blacklisted the site altogether. Its not a trivial process to have happen, i.e., you can't just have someone spam links to a site for a day and have it suddenly blacklisted. It has to go through a process of warnings, vigilance by editors (i.e. reverts and removals), etc. to the point of being deemed a significant and non-ending problem to be put in to a blacklist. Its a shame to, because there were a lot of good interviews up at DP that could be used as references (at least that I'd still like to use). I got my 2600 Christmas 1981. Pac-Mac was not yet out at that time. I clearly remember the fanfare surrounding the Pac-Man release in 1982 and getting the cart right away. Definitely look for actual sources, but it was a 1982 release date, no doubt in my mind whatsoever, for what that's worth. If could very well be very early '82. At this point, the resources from Warner/Atari are talking about the first quarter earnings due to Pac-Man. First quarter for them was Dec - Feb, so at the very least it could have been Jan or Feb '82 for release. We're trying to locate the rom release schedule to see what that states as well. Do Pac-Man carts have date stamps in the end labels? We could check and see if there is one for 81. I should also mention, I was around during the whole DP banning process as well. An individual was spamming dp links (which is looked down on there) throughout video game articles over several different accounts over a several year period. Not just video game articles tho. Even did this on Wiki's page about Easter eggs (the dyed/colored unborn chickens in a shell kind). Edited by Vic George 2K3, Tue Oct 14, 2008 12:58 PM. Sounds like it's time for DigitPress to get together with the PTB at Wikipedia, figure out who it is, and go after him themselves for basically getting them blacked out. The release date of games is unfortunately a contentious issue, even those from just a couple of decades ago. FWIW, this is the first Atari catalog that mentions Pac-Man. It is copyright 1981 (not sure when in 1981 it came out as the Rev. D edition was the 4th released that year - makes me think late in the year) and says that Pac-Man is supposed to be available in March. Edited by Zwackery, Tue Oct 14, 2008 1:18 PM. The catalog was most likely printed in late 1981, since I haven't seen that catalog until early 1982, when Pac-Man was released. They still could have physically been produced in late 81, but not released into the market until a few months after that. Although I'd have to guess and say that if they were rushing to release it in time for Christmas, there probably wasn't much time between physical production and the game hitting shelves. But that still takes some time..
Why would Atari have rushed the release if not for Christmas? Old, dated newspaper advertisements with Pac-man for sale? Atari financial statements or other accounting documents of the period that can verify the assumptions about the fiscal calendar? Edited by BigO, Tue Oct 14, 2008 1:48 PM. It depends on where they purchased it. The receipt for my family's Vader (purchased in '84, so I can't be of any help in this particular discussion) also lists the games purchased with the system as well. I was thinking Sears Wishbook but that usually came out in September and wouldn't mean they actually sold it. There's a Montgomery Ward's Xmas catalog online but they only sold the Bally Astrocade and the APF 1000 in 1981. No wonder they went under. Doesn't mean they made it in time. I found a reference to an ad in the Chicago Daily Herald, dated March 2, 1982. The ad is for Atari 2600 games for sale, and it lists Superman, Bowling, Space Armada and Snafu for sale, and later it says "Be ready for PACMAN with a PACMAN T-shirt." 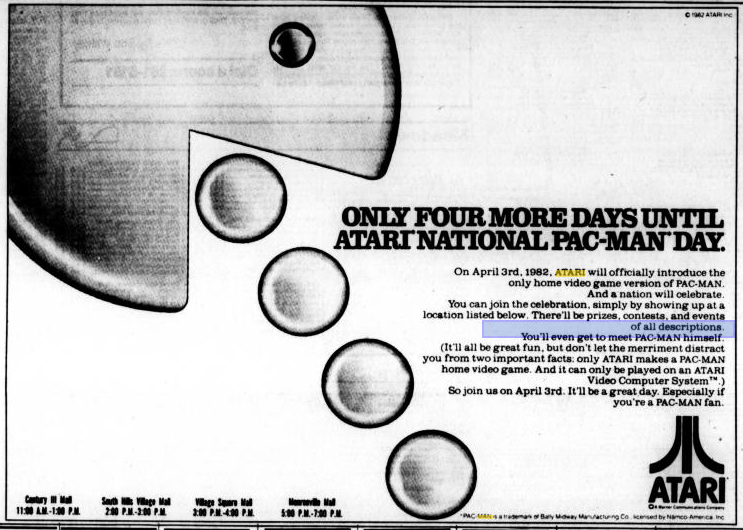 A Washington Post article dated March 23, 1982 says, "Chain Sells 3,000 Cartridges in 24 Hours Pac-Man Fever Hits Area; Stores Sell Out Cartridges"
Another article dated March 3, 1982 says, "Atari adding Pac-Man to home video." Gettysburg Times, March 6, 1982 says, "now reserve the newest Atari video game cartridge 1 Go to nearest store and put Pac-Man in layaway Full payment due upon notification that Pac-Man has ..."
This is all from Google news, limiting the selection to 1981-early 1982. Well, we're looking in to all those possibilities, and any way that anyone can help out is certainly appreciated. The one good thing to come out of this thread and experience, is that hopefully people here appreciate the process that goes in to validating material and references for an encyclopedic article or just a well referenced article in general. Contributing and editing on Wikipedia since 2005 has certainly helped me to appreciate that, and recognized the need to do so elsewhere. I had to go through the same thing on the Wikipedia Space Invaders all because Retro Gamer incorrectly published the 2600 version coming out in 1978 in two different issues now (including in their "The Definitive Space Invaders" article from Sept. 2007). Another editor was trying to use that as a reference for stating a 1978 release date, even though it was clearly incorrect. However, he did have a "valid" reference because Retro Gamer is considered as meeting reliability and notability standards on Wikipedia (published sources always have an immediate leg up on web sites, because of assumed editorial oversight. Fan sites and blogs are not considered valid sources). To people who were around at the time (such as my self) the idea that the 2600 port came out at the same time the game hit the arcades was ludicrous. But without a valid reference to the counter, it is considered Original Research (http://en.wikipedia....iginal_research). So I had to dig up several different sources (not just one) that showed that Atari first licensed the game in '79, and other references showing the 1980 release. That included Steve Kent's passage, Master of the Game's passage, Zap!, GameInformer, and others. There's a ton of people who rely on, what I consider, "web gossip" for their history. I.E. because its on a website or someone is stating it from personal experience, it must be true. There's got to be some sort of fact checking involved. There's a ton of Atari or video game fan sites that all regurgitate the same info from each other, that all usually have the same 2 or 3 sources (a specific book, or a handful of websites that were around 10 years ago). Look at the whole Atari/Amiga deal thing where people assumed the stories of Jack trying to appropriate Amiga technology for the ST were true, until Curt was able to release the original investment documents from Atari Inc. and talk to some of the other people involved, and I was able to interview some of the people directly involved and get the info out there in Brian's Commodore book. And we're still uncovering a paper and people trail from that whole time period to flesh things out more. Steve Kent's book suffers from that as well. He bit off way more than he should have with that book in an effort to get a lot of good material out there, but in the process put a lot of incorrect material in there as well. The fact checking just wasn't up to par (and I think its because of the amount of material and what it took to gather it all). So that leaves out the claimed April release date and cuts out a "Spring" release. It still doesn't account for the other discrepancines that need to be cleared up as well (quarter reports, Ed Averett interview, etc.). I think the evidence for a March, 1982 release is clear enough to shift the burden of proof over to the 1981 camp. 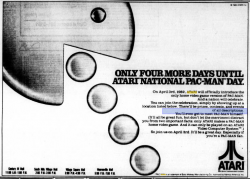 In case anyone still thinks 1981 release date has any merit, here's another article in Feb. 1982 that says "[Atari] will be releasing a Pac-Man game cartridge next month"
Here is an ad that lists April 3 as the official "introduction" date, though it was available for sale about two weeks prior. This must be where some sources get an April date when it was actually available in March. Edited by Random Terrain, Tue Oct 14, 2008 9:51 PM. What I get out of this thread is confirmation that wikipedia is chock-full of inaccuracies. Apparently, hearsay is stated as fact until proven incorrect. Consensus does not necessarily lead to correctness, and is often self-perpetuating. This would not be a significant problem, except there are so many people who quote wikipedia as if it were already fact-checked and is some kind of definitive source. Anyone who spends much time monitoring wikipedia and working for improvement of the information must feel like they're banging their head against the wall. I respect the effort, though.